The avalanche of lawsuits filed against Jerry Brown’s Delta Tunnels project over the past couple of years has continued into the new administration of Governor Gavin Newsom. In the latest legal battle in the California water wars, a coalition of environmental, fishing, and Native American groups led by the Pacific Coast Federation of Fishermen Associations (PCFFA) filed suit on January 16 against the California Department of Water Resources (DWR) to “overturn its latest attempt to force former Governor Jerry Brown’s Twin Tunnels (California WaterFix) proposal upon California taxpayers,” according to a press release from PCFFA. The suit, filed in Sacramento Superior Court by the Law Offices of Stephan C. Volker, challenges DWR’s attempt to revamp its 30-year-old Coordinated Operations Agreement (COA) with the federal Bureau of Reclamation to export more water from the Delta through the Twin Tunnels while evading scrutiny under California’s environmental laws, including the California Environmental Quality Act (CEQA), the Delta Reform Act and the Public Trust Doctrine. TheNorth Coast Rivers Alliance and the Winnemem Wintu (McCloud River) Tribe are joining the PCFFA in filing suit against DWR. The Tribe, under the leadership of Chief Caleen Sisk, is currently fighting to bring the winter-run Chinook salmon, now thriving in the Rakaira River in New Zealand after eggs were shipped there over 100 years ago, back to the McCloud River above Shasta Dam. On December 12, 2018, the Department of Water Resources entered into two controversial agreements before Jerry Brown left the Governor's Office: (1) an Addendum to the Agreement between the Trump administration and the Department of Water Resources for coordinated operation of the Central Valley Project and the State Water Project and (2) an Agreement to address the Effects of the California WaterFix on Central Valley Project Operations by and between the Bureau of Reclamation and DWR (“Hold Harmless Agreement”) and collectively with the COA Addendum Project. "In taking these actions DWR violated CEQA, the Delta Reform Act, and the Public Trust Doctrine," the lawsuit states. The lawsuit alleges that DWR’s attempted COA addendum would export more water from California’s Delta and its upstream reservoirs when imperiled fish populations can least afford it — during drought years — for export to San Joaquin Valley corporate agribusiness and Southern California water interests. “Although the impacts on the Delta’s beleaguered salmon and other fisheries could be potentially calamitous, DWR has claimed no environmental review was needed. It granted itself an exemption from the California Environmental Quality Act on the grounds that their action was merely an 'ongoing operation' of the State Water Project (SWP)," according to PCFFA. 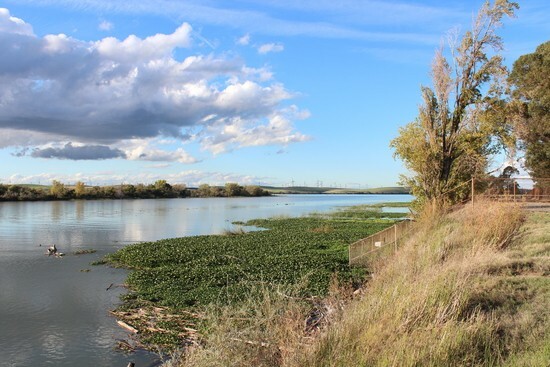 Delta Tunnels opponents argue that DWR’s revision of the COA would worsen existing SWP operations by increasing exports when the Delta has the least water available for fish. “Instead of restoring the Delta as scientists agree is critically overdue, the Twin Tunnels would steal its flows when fish most need protection, pushing salmon fishermen closer to the brink,” said Oppenheim. “Before DWR began exporting Delta waters south some 50 years ago, historic outflows to San Francisco Bay supported salmon runs in the millions of fish. Today, several salmon species are clinging to survival as their numbers have dwindled to a fraction of their historic population,” said Oppenheim. I have contacted the Department of Water Resources for a comment on the lawsuit, but haven't heard back from them yet. The Delta Tunnels are not an isolated project but part of a much larger water diversion and privatization scheme. Chief Sisk emphasizes the deep connections that exist between the Twin Tunnels, Sites Reservoir and the Shasta Dam raise proposals. “The Twin Tunnels, Sites Reservoir, and the Shasta Dam raise ‘are all 1 Brown WaterFix project’ to get the Water Mongers more water to sell back to the communities, towns and cities,” Sisk said before Brown left office on January 7. The California WaterFix is a proposal to build two massive 35-mile long tunnels under the Sacramento-San Joaquin River Delta to facilitate the export of Delta water to corporate agribusiness interests and Southern California water agencies. The project would not only hasten the extinction of Sacramento River winter and spring-run Chinook salmon, Central Valley steelhead, Delta and longfin smelt, green sturgeon and other fish species, but would imperil the salmon and steelhead populations on the Trinity and Klamath rivers. As the lawsuit was filed, populations of Delta smelt and other pelagic (open water) fish species in the Delta continue to collapse. For the first time ever, a fish survey that the California Department of Fish and Wildlife (CDFW) conducts every autumn turned up zero Delta smelt throughout the monitoring sites in the Sacramento-San Joaquin River Delta in September, October, November and December 2018.